Here is a series of hiking trails that link together to create a fairly lengthy hiking trail loop. The description starts at Tucker Preserve in Pembroke. This trail connects to Rocky Run Conservation in Hanson and creates a loop by crossing the Indian Head River on State St in Hanson and enters into Hanover. Once in Hanover the street becomes Cross St. It then turns on Broadway St. to connect with the Indian Head Trail which ends at Luddams Ford Park where you can cross to the Pembroke side of the park to complete the loop. 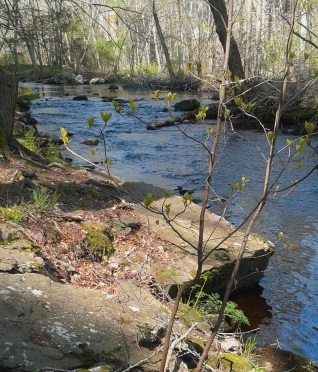 It is a great route to hike if you are contemplating a kayak paddle up or down this section of the Indian Head River. There are several small rapids and shallow areas to be concerned with as well as fallen trees blocking the way. Hiking the full loop will give the explorer a full view of almost any angle of this river, hence the reason to call it the Tour of the Indian Head River. This is the kind of hiking route that one could visit the area many times and unless you take the time to check out a kiosk or any info provided about the area, one may never know this loop existed! Many thanks to the Wildland Trust for including this on their kiosk! but personally I feel that a first time hike is best done starting in Pembroke. Starting at the Luddams Ford Park on the Pembroke side, cross the grass lawn. Along the way you may notice remains of many of the former industries that stood at this spot. 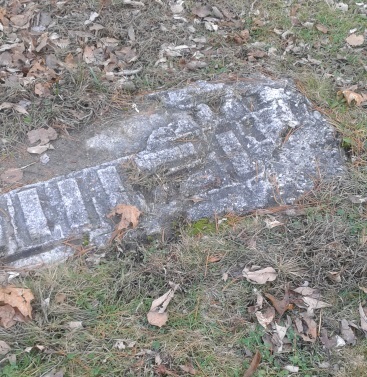 Some of the industries noted were an Anchor Works, a Grist Mill, a Carding Mill and the Clark Rubber Factory. Head toward the kiosk where Tucker Preserve starts. Referring to the map is helpful, yet not all trails in the area are on this map. There are two routes through Tucker Preserve. The lower trail that runs along the Indian Head River, this one is scenic and somewhat rugged. 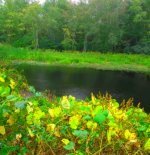 The second is above the river on higher ground and easier stepping, though it runs into a network of private hiking trails that you may find yourself running off course if not paying careful attention. 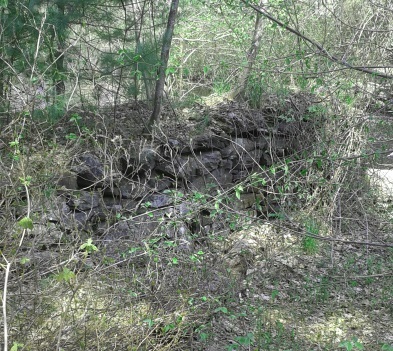 Just in to the preserve and to the left are remains of the Clapp Rubber Factory. Though interesting, are not easy to navigate and not suitable for small children to wander through. Shortly up the trail, another faint trail that looks like it was once a road leads to the left. In season (late may early June) a field of phlox stands here. 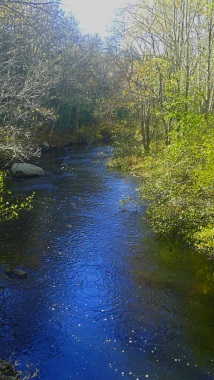 The trail runs along the Indian Head River, a tributary of the North River. Here the river is wide and many good view points are along the way. In the early part of the hike, there is a rustic seating area with a campfire pit. Across is a field of ferns. 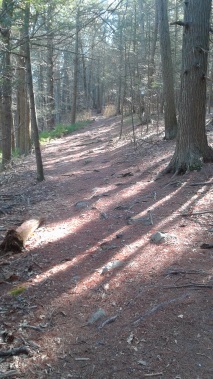 The trail is wide and full of wood chips here. 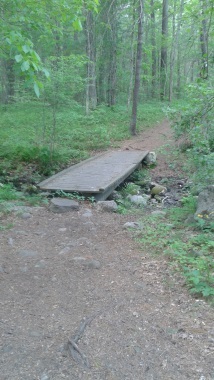 Soon after there will be a small bridge over a stream that can be already dried up in late spring. In the fall it was running quite well! At .16 miles the trail crosses a fern filled utility line just after another good river viewing area that looks like a good canoe or kayak pull in. Shortly after this you will come upon a well made bench on a bit of a hill with slightly obstructed views of the river. The trail climbs a bit here over an abundance of tree roots. At .31 the first trail intersection. Continue straight here. This is one of the points where going left could bring you to the easier upper hiking trail. 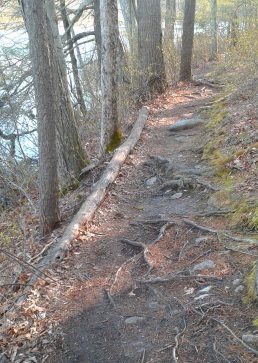 The trail narrows a bit after this, becomes root filled and comes to another river observation point. It passes through a low rock wall. Then it starts becoming a bit rugged and begins it's first climb remaining root filled. At .38 miles the trail comes a point where there is a large boulder above and the trail leads along this hill as the river is downhill, a steep decline away. The trail continues with gentle inclines and declines still narrow and a bit rugged as it is cut into the hillside. Soon after it leads thru a rock wall, there will be a small gap and it then runs along another wall that intersected the first and sweeps down and along the trail. 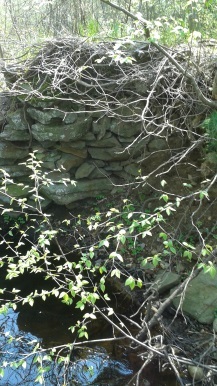 There will be a narrow trail makes an opening through this rock wall. Shortly afterward we come to the last intersection in the preserve on this trail. 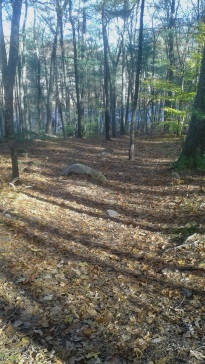 Here the upper preserve is left and our route is straight and downhill and over another stream. This is the second intersection where one can break away and travel to the route above. The upper hiking trail. After the stream crossing the trail will stay narrow and become increasingly rugged as it still cuts along the hillside. The roots continue and get larger and rockiness increases. Shortly down the trail the river splits. But shortly later it is one again. This area is a good wildlife viewing area. 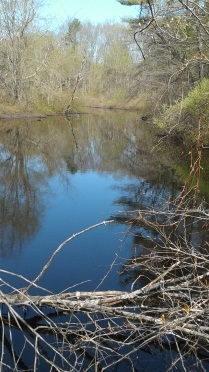 A beaver jumped into the water and birds perched on rocks or fallen trees flew away when I approached the area. Notice the river is very still here. On subsequent trips I noticed this wildlife area does not exist. It was here on a day that I visited most likely at low tide time. 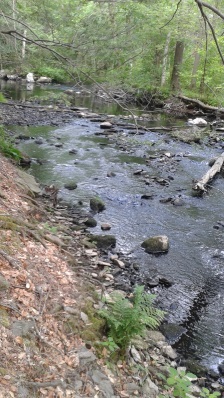 The Indian Head River is a tributary of the North River. Tides change the landscape of the river. At .66 the river splits again and a fallen log lets you over to the island between the two waterways. The log was getting old, my last visit I could not find it! 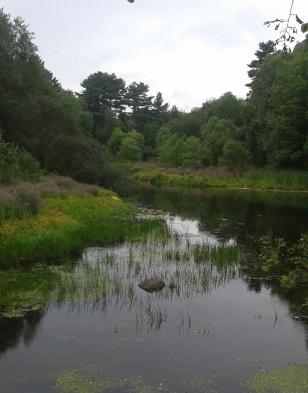 Soon I can hear running water and see a heron fly away! 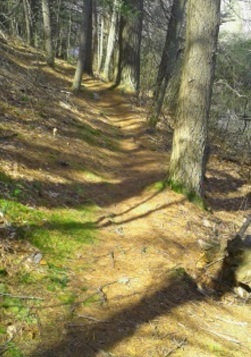 A trail intersects leading left uphill and away. Nearing the end of the island, large rocks appear on the hiking trail. These make great places to stop, have a snack and take in the beautiful views of the river. Looking across the river, pieces of dam that gave way can still be seen. At .72 miles we come upon the back side of the factory on Water St in Hanover where the dam once was. 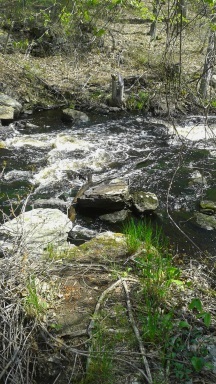 Here there are a bit of rapids for anyone navigating on the river. The Tucker Preserve boundary line seems to be here. A bit of the history of this area is included on the Indian Head Trail end of this route. Continuing down the hiking trail there are a several trees that cross the trail and only slightly block the way, easily stepped over. Then you reach the third and largest tree at .80 miles. Though the tree is large I was able to step over it. If this is not acceptable to you an alternate way goes to the left. It runs up hill a bit and then meets another hiking trail that goes down hill and rejoins the three town loop trail. The alternate trail continues up hill and meets the network of private trails. 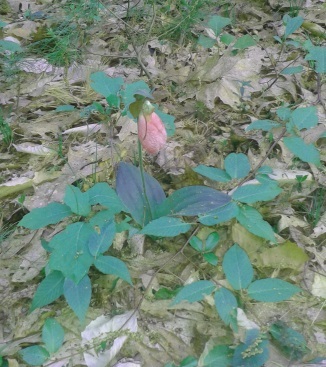 This is another connection to the upper trail. mini boulders left by a glacier from thousands of years ago. They make the way a bit difficult. 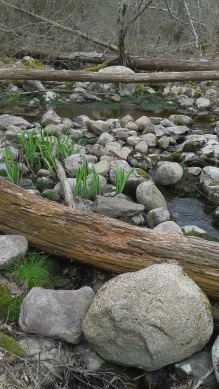 Looking riverside, around .90 miles you should notice a large boulder at the edge and partially in the water. to make a climb up top of this boulder easier. on top of this boulder! Most likely a glacial irratic. 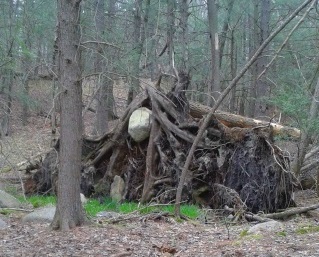 Another interesting point on the trail is a fallen tree with enormous roots able to lift a small boulder into the air. 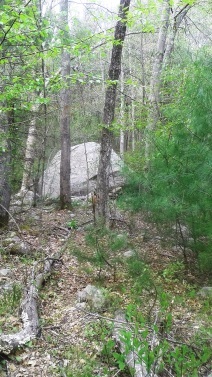 The tree roots have this boulder sitting tightly between them with the boulder possibly 5 to 6 feet high. As I pass by I think how long will it take for the roots to rot and release this boulder. Wish I could be there to witness the change. At this point it appears we are entering or coming close to the Rocky Run Conservation area. The trail will become a muddy track and shortly after intersects with a wide trail at 1.05. At this point the easier upper trail and lower portion intersect and continue. If you have followed the upper trail guide the rest of this hiking trail guide will be followed by both ways. At 1.08 there is a small trail split that will join together again shortly. What I like to call a donut. If you go to the right there will be another side trail that will lead you out riverside. It brings you to an area that looks like many others have enjoyed (campfire ring). It is grassy and brings you to another rapid section on the river. the sides are lined by grass. Soon you will pass by another large boulder. of small hiking trail donuts. 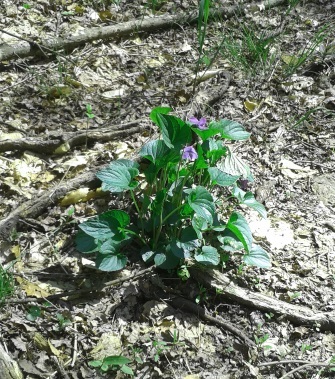 Along side one of these was this small "bouquet" of violets. Did you know these are edible and have a medicinal use as well! 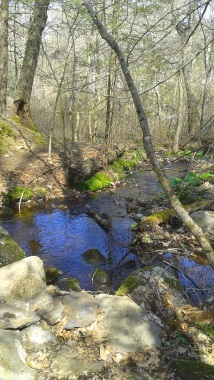 the side of Rocky Run Stream. Shallow but clear, good place for a dog. Many a dog owner do travel this way! 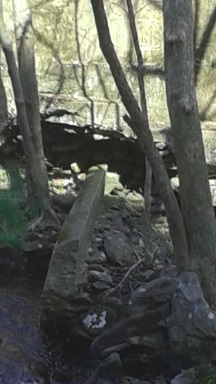 The trail curves to the left and then at 1.17 crosses over Rocky Run by stepping stone bridge. Once over you will come upon an intersection. 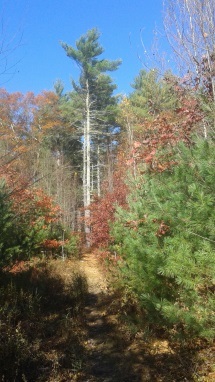 This is the loop trail through the conservation area. Go to the right for the three town loop. 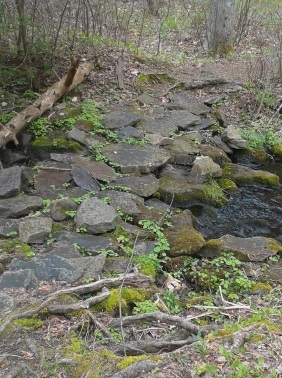 Visit the page Rocky Run Conservation for a more detailed info on this conservation land. The hiking trail curves to the left and follows closely to the Indian Head River. Very shortly there will be rapids on the river. To the left you will notice high ground above leading to an extensive outcropping. Some night time visitors have abused the area a bit. Afterward at 1.25 looking to the right you will notice what looks to be a stone wall leading through and toward the river. This is a great side trail exploration. Not only interesting, but historical as well. you over to a small embankment. lead you out into the river a bit. There are more rapids here. built on Indian Head River to create a lake. From the far side of the embankment you can see more dam structure. I startled a somewhat large water snake here! The hiking trail will soon climb at 1.37 and reach a high ground above the river. At a midway point along this climb, a trail will lead off to the left. At the top of the climb another will lead to the right and to a observation point above the river, though it can still be seen by the trail we are on. Shortly after all three meet at an intersection and continue on straight. climb to this high ground! The trail levels and ends at an intersection with a black chain link fence at 1.45 miles. There will be an intersection here. The fence lines both trails. 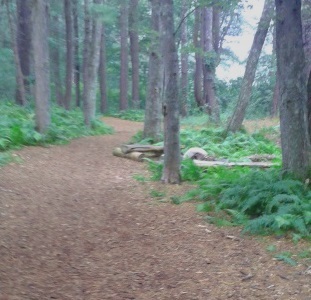 The hiking trail leading left is the start of a circuit tour of the Rocky Run Conservation Area. Our route continues straight and the trail becomes open and wide. We soon meet the other end of the fence and the trail leads downhill. At 1.51 the trail comes out to State St in Hanson. To continue go right on State St. Crossing the street is the safer route, but along the way at the parking area, is a hiking trail down to a peninsula in the river. Either choice will reward you with views of Indian Head River. It amazes me how many speed by this area in a vehicle and never stop to enjoy the beauty! The view from the peninsula on State St.
an explore of that peninsula is irresistible. 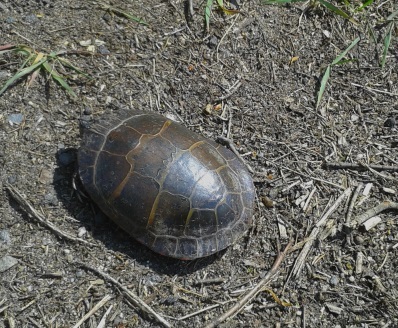 Turtle trying to cross the street. going to run it over, instead sent it tumbling. I helped Mr. Turtle the rest of the way. Lots of animals today!! Follow to the intersection and turn right on Broadway St to access the Indian Head Trail just a few steps away. The Indian Head trail is well marked here on a wide flat easy trail and the river will be on the right. This upper hiking trail alternate way is much easier to navigate. There are two main areas to access this portion, both are a moderate uphill climb. The first access point is at the first intersection at .31miles. Many of the regular hikers take this way. The second is at the second intersection at 1/2 mile. For	this trail guide we will use the second intersection, but a	detailed trail guide using the first intersection can be found at the inner trail loop	description on the Tucker Preserve page. At the second intersection take the uphill climb to the left. 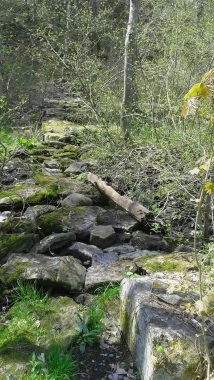 The stream above the stepping stones over it has a water garden appearance to it. a narrow winding trail with good views of the stream. Soon it comes to an intersection at .61 miles. 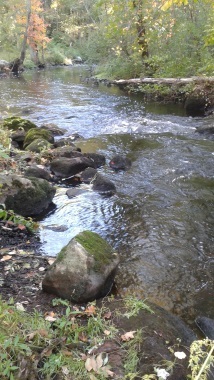 over the stepping stones that cross the stream. 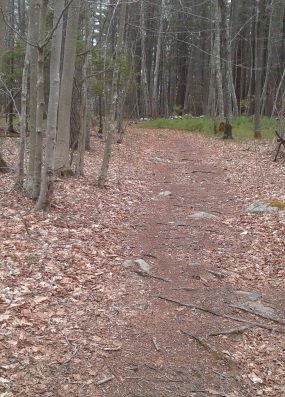 The upper trail continues wide with gentle winding through an open forest. Views of the river below open up as it turns to the left. At one mile we arrive at the opposite side of the old factory on the Hanover side. 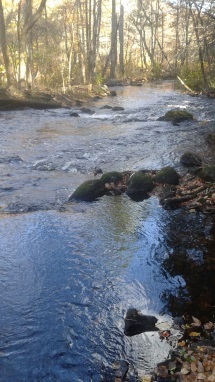 Here there are some rapids and the water can be heard rushing down stream. Shortly afterward we reach the preserve boundary only noticeable if you are looking behind you. The markers on trees are only seen in the opposite direction. The hiking trail will continue wide, cart path sized and easy to navigate. There will be several trails leading in both directions. Those to the right lead downhill and connect with the lower route. To the right lead deeper into private land. to the owners residential property. The signage at Tucker Preserve says that foot travel only is welcome here. No motorized vehicles, please. Continuing along there is much evidence of maintenance work that has been done in the past. At 1.22 the trail widens and becomes rocky. There will be a slight descent and a sharp turn to the left. 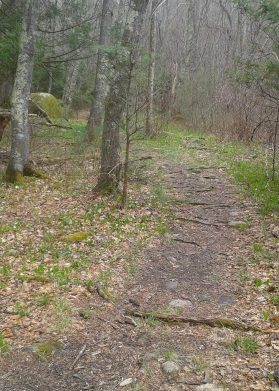 The trail had a deep forest feel here even in early spring before the foliage has emerged. It will also become muddy with large pools of standing water to pick your way around. Just after, there will be a trail leading to the left, our way continues straight, but curving slightly to the right and remaining wide. Just after this curving another narrow hiking trail leads in from the right, trails everywhere! The forest will open up a bit and another couple of fallen trees across the trail are easily climbed over. The hiking trail will curve to the left and at 1.38 will end at an intersect with another wide trail. Go right here. Going left, though beautiful will lead to posted land. The hiking trail is now a bit wider and road like. At 1.50 a trail leads left. Shortly after a fork in the trail. The two trails on the left circle what looks to be wetland at certain times of the year. Both trails lead to another private property. Our hiking trail continues to the right and leads downhill. It starts to narrow and become increasingly rocky as it is entering Rocky Run Conservation on a continuous gentle downhill track. At 1.62 carefully looking to the right you should notice the narrow lower trail entering onto this trail. Here the two trail routes meet. This alternate portion is a bit longer in distance but far easier to navigate and seems to be the favored way through the area by most visitors. Continue the rest of the guide above from the intersection. The full length of this hike will come to around 3 miles. I say "around", why? There is much to see and explore here, the side trails to river spots and the two dam sites. The peninsula at the Hammond Bridge on State St, all the small observation spots along the Indian Head Trail. These all could add up to make a 4-5 mile hike. Make sure to wear some sturdy footwear, bring water and snacks! This could be an all day event!